1st time poster, short time reader. Today I found a 540. Now I need a rod for it. Where would be the best place to find one? MRM lists the 540 as 1970-71. I'm not seeing it in any Garcia Annuals 1969-72. So, was it uncatalogued by Garcia (USA) and/or European market only by Mitchell? Anything special I should look for besides actually seeing the 540 side plate? Of course the handle had to block it. Attached is what I have so far. Wayne, I would drive two hours to look at that reel too..It appears authentic. One of the most valuable Mitchell reels. Garcia appeared to have distributed these, though it's not conclusive which distribution of Garcia (UK, Canada or US). John, the thread below contains info regarding cataloging these reels. Apparently they were photographed, but the photos were not published, since sales of the 510 and 508 were not considered successful enough to warrant placing the 540 in a catalog and mass producing them. I picked the reel up today. It looks nearly flawless to me. Just a few small little scratches that are very hard to see. Sounds like it could also use a pinion shim, but scared to open. Here are a few pics. I haven't been involved in this conversation till now, but with the pictures you've posted, I think I see something that I'm sure some of the other mates will when they see your pictures. The font of the 540 doesn't look to me like I would expect on this reel. Here's a link to some pics of a 540 so you can see for yourself. Now, I can't be 100% about this because I don't claim to have seen all things "Mitchell", but it looks different than any other Mitchell engraved model number that I've seen, and may indicate something not authentic. Is there any sign that the 540 could have been placed over another number? ffwayne, welcome to the Group . The 540 as you now know is a very special find - Congratulations . The different locations of the serial number threw me off as well. I have 1 Dual 510 and 2 Garcia 510s and all of the serial numbers are stamped on the side of the fork - Hmmmm. The body of the 510 and 540 is NOT interchangeable though. The rotor stem on the 540 body is longer than the 510 - same as trying to fit a 440 rotor on a 410 body....It won't work . I have little doubt that this is a real 540 with "loose" engraving from the factory. With regards to the serial number...….see follow on post. P.S. ffwayne, I realize we haven't answered your question with regard to the proper rod for your 540......But I'll answer that too - eventually ---- I'm on a roll here! Last edited by cshannon772 on Fri Feb 08, 2019 7:15 pm, edited 1 time in total. With regard to the different locations of the serial numbers on ffwayne's 540 and my 540 and the fact that the serial number on all of my 510s is on the side of the fork, I compared two of my DUAL 500s. Now there can be no mistaking the possibility of changing out the bodies because they are black - the only other black 500 Series Mitchell was the 524 and obviously those bodies weren't interchangeable. So apparently, Mitchell stamped the serial number on the 500 Series reels in two different locations - These reels are identical....except for the location of the serial number . I have no idea when that change occurred though or even if there was a definition point . Just another thing that makes me go Hummmmm! I'm glad you reminded me about the longer rotor stem on the auto-bails that make necessary to have a 540 body. Since we've run into "loose" engraving before, I own one myself, it's entirely possible that all that I remarked about may have been at the factory.???? Another thing that I have a question about. I can't recall seeing a blank sideplate in circulation. One without a model number on it, unless it was some sideplate for one of the European models. The factory may be the only place where sideplate with no model number could be found. So now that I've kind of hi-jacked your post, we'll get to your actual question. The Mitchell 540 was never advertised in the United States - only the 508 and 510. Unfortunately the 500 Series was never a big seller here in the U.S.. But these rods will work perfectly with your Mitchell 540. This is one of mine with a GM 510 mounted to it - one of my "user" rod/reel. These rods are not common and will demand a premium price for one in good/excellent condition....but if your mounting a Garcia Mitchell 540 to it, well worth the price! The only Mitchell that had no engraving, which I'm aware of was the 1st - 4th Version CAPs up until 1953/54. Although I did see a 308 not long ago on the "big site" which looked factory to me with no engraving on the faceplate...Must have slipped through the QA process . While the model number engraving is a bit rough, this may be a product of early engraving on these reels as indicated by the side stamped serial number. (see Kim's post below from an earlier topic). My vote is for authentic. "While looking for information on other topics here I noticed the serial number stampings on these feet are in 2 different locations. The reason I think of the change is the numbers are more readable and easier to make the stampings. Your thoughts?? I have a limited amount of these reels to make any further guesses. Somewhere between the GM 540 and the top GM 510 the change occurred. Can't tell if replaced foot. No Dual sticker on plate. Picture of reel in Dennis Robert's Value Guide has serial number stamped on the side of the foot. I checked my GM 540 and the stamping is on the edge. Serial number 9,***,***+. Maybe after a certain date Mitchell stamped these on the edge instead of inside flat portion of foot for these style of reels?? Once again your knowledge and discussion is priceless. For now it will stay on a shelf for display. Hopefully one day I can display it with a proper rod. 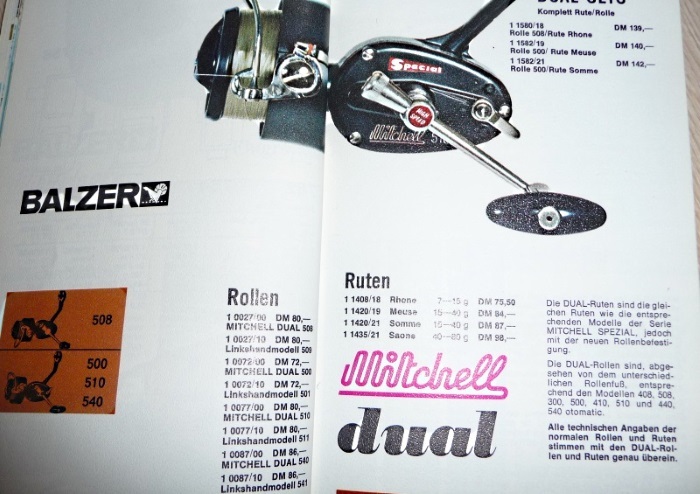 There were several styles of rods for that reel. 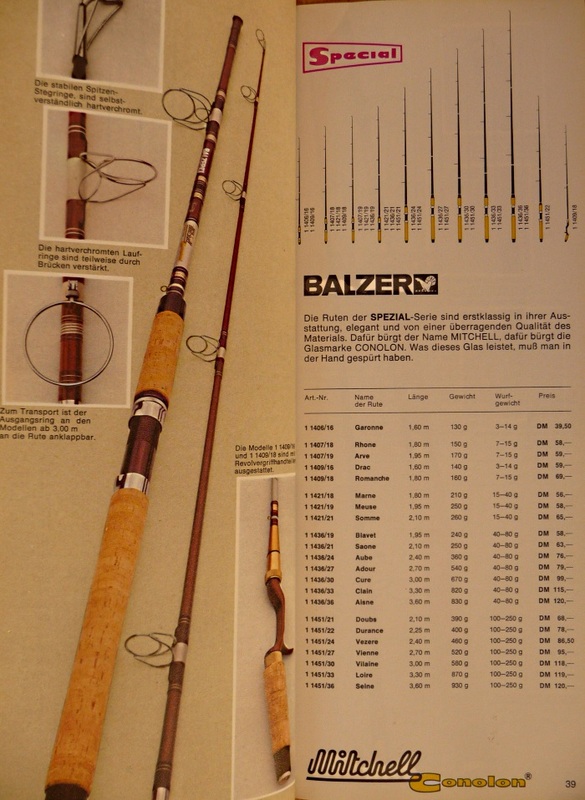 The rod blanks were all made by Conolon in CA but one was finished in Europe and labeled "Balzer" "Special", these were for the DUAL Series of reels (and in my opinion much prettier/nicer) and the other was finished in the U.S. labeled "Conolon Live Fiber" (lower quality) or "Garcia Conolon" (higher quality). For your 540, in my opinion you need the Garcia Conolon rod. Thank you for giving us old, ah, experienced,, (that's better) collectors a great topic to explore and discuss. So I would propose a new thread for Mitchell (DUAL and Garcia) 500 Series serial number location. We have a good idea of when these models started and stopped, maybe we can define when they changed from side stamped to back stamped or the other way around...Very interesting. 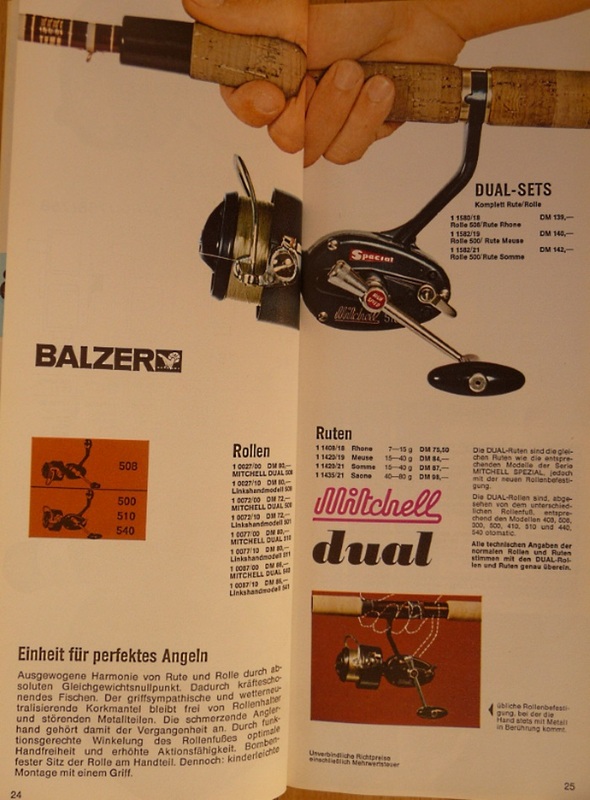 the company Balzer Germany had the dual fishing reels from 1971 with the models 500/501, 508/509, 510/511 and 540/541 in the catalog. The associated rods were called Rhone, Meuse, Somme and Saone. These rods were also offered as a set and only with the Dual 500. I include two catalog excerpts from the Balzer catalog in 1972, as you can see the prices. 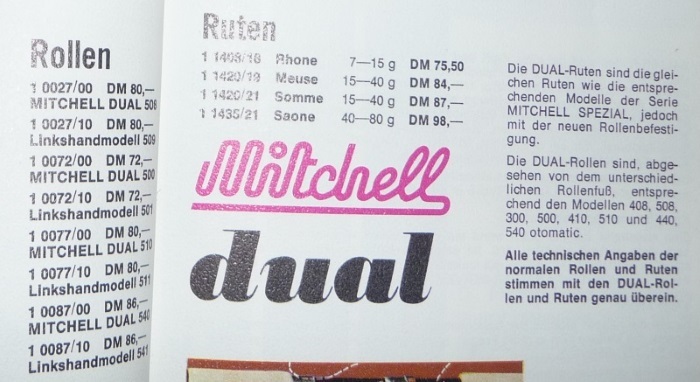 I noticed that at that time the Mitchell 440 81 DM and the 540 was only marginally more expensive and that 86 DM. These days it is very different, the dual fishing reels are very sought after and quite expensive. May I be familiar (since you and I are Mates) and say Grüß dich? So wonderful to see your contribution here - thank you! Of course I help there. Here are some bigger pictures. Thank you for your catalog enlargements and writing out the model numbers/names! Thanks for pointing me to the MRM thread with discussion on US cataloging. Garcia Conolon Live Fiber rods not cataloged by Garcia. If you click the link to the MRM thread, you'll see the decal and other information.